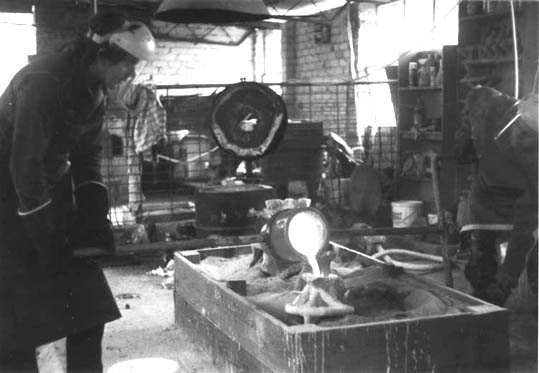 Kim at the foundry with Peter Danuser (left) pouring bronze into a ceramic-shell sundial mold. The foundry is set in the South Gippsland hills and has been in operation since 1987. I can melt about 30kg of bronze at a time. Larger items are cast in sections and welded together later. 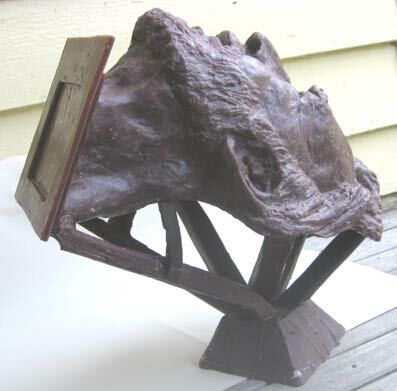 A sculpture is made in wax, plaster, plasticine, clay etc..
A plaster or flexible mould is then taken from the original. Molten wax is painted into the inside of the mould and allowed to cool, and the mould is then removed. Wax runners (once melted, they form the tubes the molten bronze flows down) and riser (air vents) are then attached to the wax. The wax is encased in a ceramic shell. This is done by dipping the wax into a slurry of pre-burnt clay, water and silica, and sprinkling with grains of zircon and flint-clay. After each dipping, the shell must dry and the process is repeated until the shell becomes thick enough. Bronze is melted in a furnace. The molten bronze is poured into the shell cavity. The ceramic shell is broken off. Runners and riser are cut off and castingl is cleaned with a variety of burrs, wire brushes, sand blaster, etc. Then the bronze is patinated (made to go a nice colour) or polished.